TAIUNA to appeal in the U.S. for Taiwan to be part of the U.N.
Taipei, Sept. 7 (CNA) The Taiwan United Nations Alliance (TAIUNA) on Friday gathered a 23-member delegation to embark on a trip to New York to express Taiwan's desire to join the United Nations (UN). TAIUNA President Michael Tsai (蔡明憲) said in an interview at the Taiwan Taoyuan International Airport prior to the team's departure that the objective of the trip is to let United States authorities and the international community hear the calls of 84 percent of Taiwan's citizens for it to join the United Nations. Taiwan has tried without success to re-enter the U.N. since 1993, after losing its seat to the People's Republic of China in 1971. Tsai pointed out that Taiwan and the U.S. should also strengthen their diplomatic, security and military relations and cooperation. He added that the relationship between the two countries should be changed from "non-official to official." 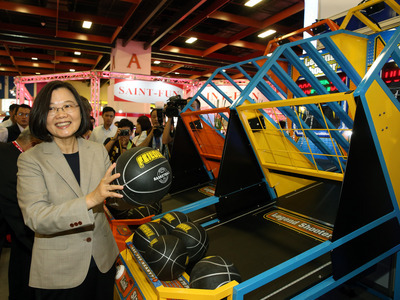 Tsai also expressed wishes that Taiwan can play an important role in U.S. President Donald Trump's foreign affairs strategy, adding that for example, Taiwan can work with the U.S. and Japan in the Taiwan Strait and South China Sea. The delegation is expected to meet with members of the U.S. Congress and officials, Tsai said. Since TAIUNA was formed in 2003, the alliance's representatives have been heading to the U.N. headquarters in New York every year to call for Taiwan's inclusion in the U.N. This year is the 15th year TAIUNA is doing so. The delegation plans to mobilize up to 1,000 people to gather in front of the U.N. headquarters to make its wish heard.